This was an early Christmas present this year, and already it is one of my favorite DC things. It shows the District’s neighborhoods by their names, creating a very cool effect. While this is extremely useful for determining which neighborhoods I haven’t yet covered in my Where We Live series, it’s also just really cool looking. There are Ork posters for many different cities, and DC is a fairly recent addition to the list. They’re attracting a big following too– check out where the posters have been spotted! You can purchase a poster online, or at Reiter’s Books downtown. I happen to think the Metro map is pretty cool to look at– it helps you figure out routes, but it’s also colorful and interesting. 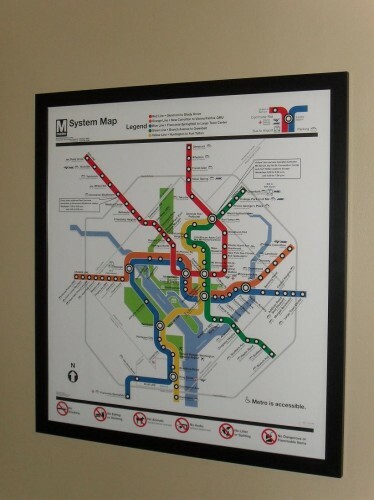 Lucky for you, WMATA sells their full-size Metro maps, so you can hang one up at home. And if that’s not enough, there’s always a Metro shower curtain too! I’ve found that having a full-size Metro map on my wall is a big conversation piece, and guests often head over to it to check it out (and consult it when we’re figuring out where to head for the evening). Here’s the thing though– the poster measures 30 3/4″ tall and 28″ wide, which is definitely not a standard frame size. Even though the poster is just $25, custom framing drove the cost up to $200. 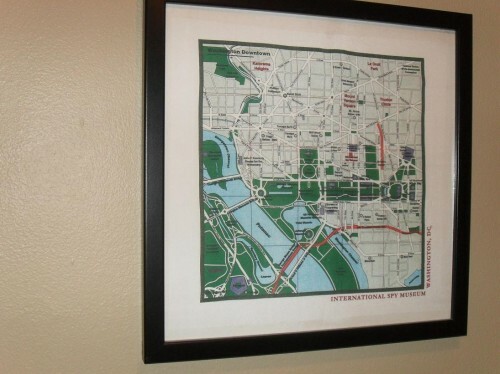 Several years ago, I was given a DC map silk scarf from the International Spy Museum. I got it custom framed to hang in my house, and I really like how it looks. Sadly, the Spy Museum no longer sells these scarves, but the point here is that you can find cool DC maps in unexpected places. 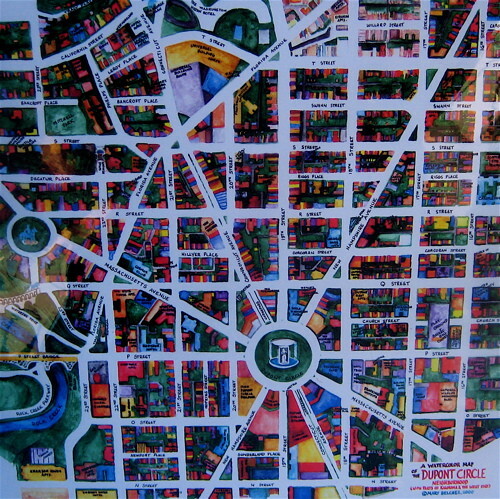 Mary Belcher is a local artist who paints watercolor scenes and maps of the District like the one in the photo above. She sells her paintings over at Eastern Market on Sundays, and this time of year she’s over at the Downtown Holiday Market. These neighborhood maps are beautiful, and call out the particular buildings and parks that define a neighborhood. Mary has maps for Dupont Circle, Adams Morgan, Capitol Hill, Mount Pleasant, and Georgetown (among others). Who knew that the FAA sold cool DC maps? If you’re interested in the historical roots of the city, that’s your place to go for inexpensive maps. 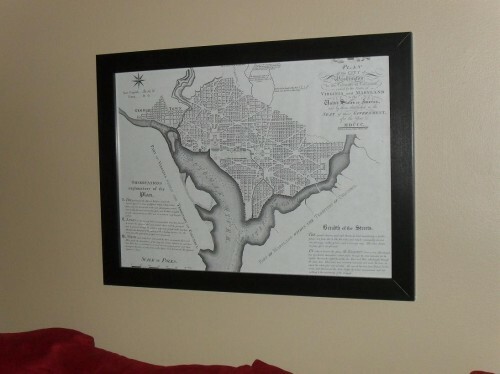 They’ve got the 1792 L’Enfant Plan as well as the 1800 Ellicott Plan (I’ve got both), and they’re great quality and huge. 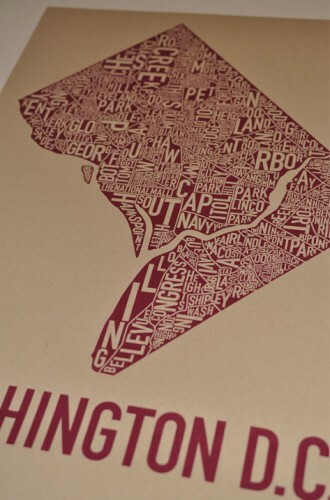 So if you’ve got a DC history buff on your Christmas shopping list, consider one of these. Well, now you know how ridiculously nerdy my house is– seriously, maps dominate the walls of my living room and kitchen. I like that they’re functional as well as decorative, and show how much I love urban planning and DC. So if you’ve got someone in your shopping list who has bare walls and who loves the District, I might have just done your Christmas shopping for you. This is just about one of the coolest personal collections I have ever seen. Very impressive. We’ve got to get you the 1901 McMillan Plan for the trifecta! I have that Ork map of DC in my office (in blue/red) and I LOVE it! highly recommended. 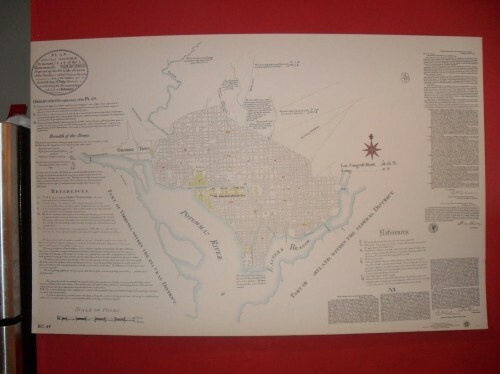 And a hand-cut DC map by the same seller. We have Philly, DC and Brooklyn ork posters. The screen prints all come hand signed for extra sweet, sweet nerdiness. I bought the Ork poster for myself earlier this year. I love it! So unique. I have the Ork poster (grey and white) hanging in the front hall of my home in Santa Cruz. When people ask where I came from, I can point it out in detail. Another wall has a poster by Art Shark of cherry blossoms and the Tidal Basin. I am not sure if these things make me less homesick or more, but I love looking at them. Excellent! Gift-ideas for the map-addicted spouse for years to come. And for wearable maps don’t forget the DC Map tie, which is sold at the Building Museum gift shop (and you can get map ties for other cities, too).